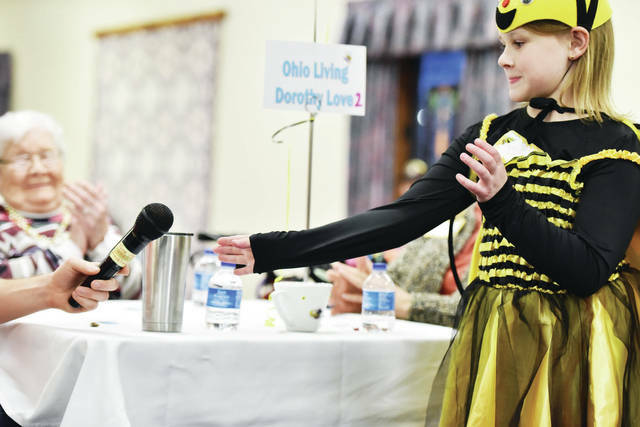 “Stinger bee” Rowan Schnelle reaches for the microphone during the Altrusa Club’s adult spelling bee, recently. SIDNEY — Ohio Living Dorothy Love’s Amos Community Center was the site of the 12th annual adult spelling bee, recently, sponsored by the Altrusa Club of Sidney. 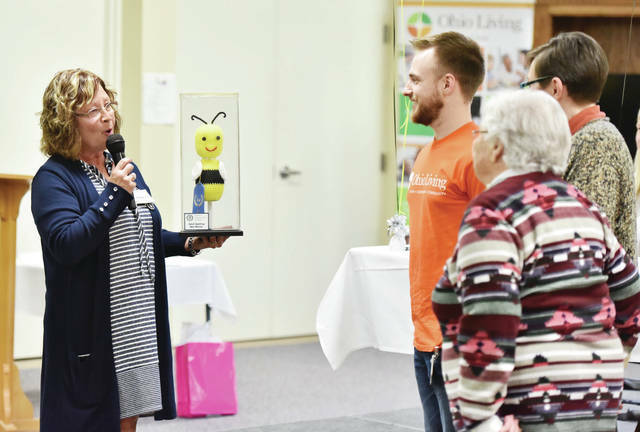 Nine teams of adults competed in the bee which raised money for scholarships given annually to Shelby County youth and for other literary projects supported by the club. Audience members cheered on the teams for 12 rounds as the Ohio Living Dorothy Love Team No. 1 took first place by correctly spelling the word, “diminuendo.” The Christian Academy Schools team placed second and the Fairlawn Schools team was third. Rowan Schnelle was the designated “stinger bee,” and when a team spelled a word incorrectly, she popped a balloon at their table which officially eliminated them. Patricia Ann Speelman, of the Sidney Daily News, was the bee-nouncer, Tracy Kies from WMVR was the mistress of ceremonies and judges were Dan Cecil and Adrienne Fortkamp. 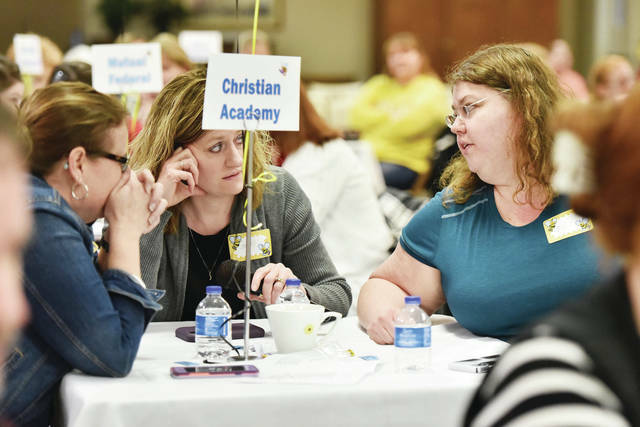 Local businesses, individuals and schools participating in the event included Christian Academy Schools, Lehman Catholic High School; Mutual Federal Savings Bank; Ohio Living Dorothy Love; Shelby County Libraries and Wilson Health. The Sidney Elks Lodge No. 786 donated its Anniversary Grant monies to Altrusa, sponsoring teams from Botkins Schools and Fairlawn Schools.